Photo: Arthur Orchard – there she blows! Like all of Eaglehawk Neck’s famous natural attractions, The Blowhole was also formed through millions of years of water and wind erosion. 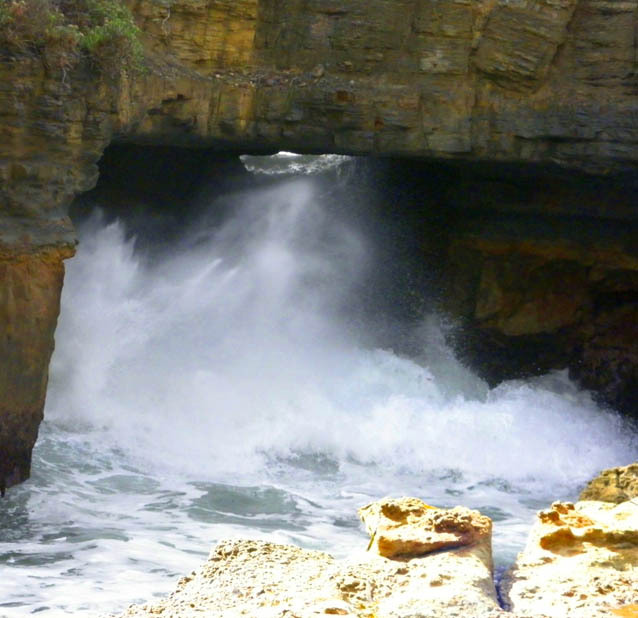 Depending on the ocean swells on the day The Blowhole can amaze you with its raw power as huge waves force their way through the small opening from the ocean and smash into the massive boulders in the cauldron in front of you. The spray can be easily seen from the other side of Pirates Bay. On calmer days the intensity is less but still a sight to behold; and you can usually see right through the ‘Tasmania’-shaped hole to the ocean beyond. A steel walkway down to the viewing area of the Blowhole was destroyed during a severe storm in July 2016. Safe walking tracks will take you high up onto the cliffs fronting Fossil Bay and the Tasman Sea, an awe-inspiring sight on a ‘good’ day. Public toilets are nearby, soon to be replaced by the Parks & Wildlife Service.